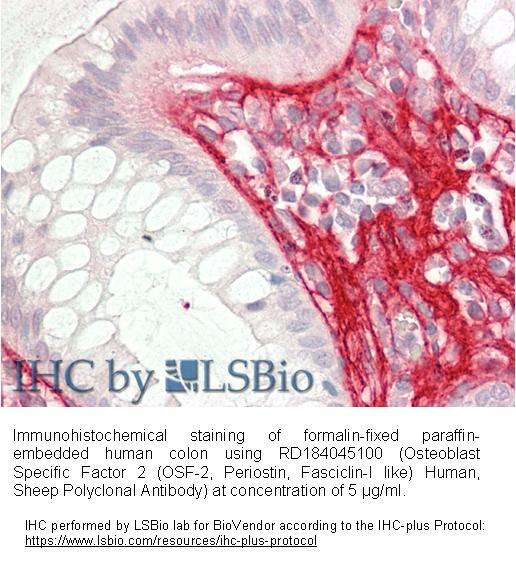 The antibody was raised in sheep by immunization with the recombinant Human OSF-2. The immunization antigen (75 kDa) is a protein containing 648 AA of recombinant Human OSF-2 and 23 AA, N-Terminal HisTag and Xa – cleavage site (highlighted). The antigen contains amino acid residues 22 to 669 of the human OSF-2 precursor. 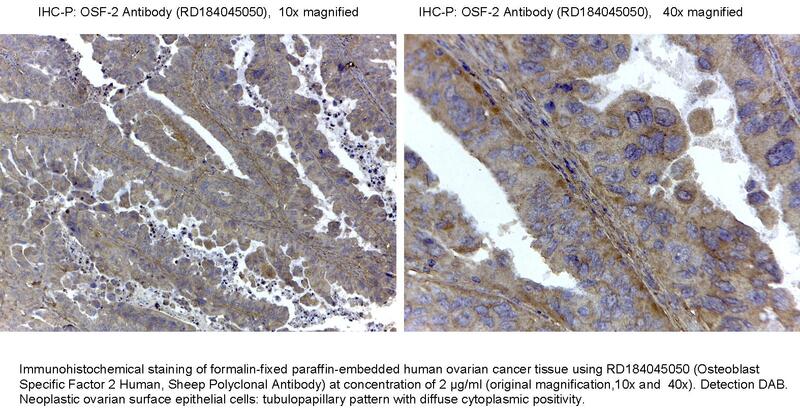 The antigen includes all four fasciclin domains of OSF-2. Immunoaffinity chromatography on a column with immobilized recombinant Human OSF-2. 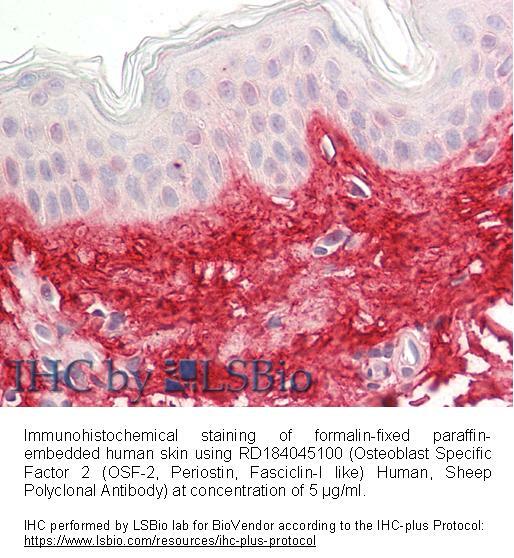 Periostin is a disulfide linked 90 kDa, 811 amino acid protein originally isolated as a osteoblast-specific factor that functions as a cell adhesion molecule for preosteoblasts and is thought to be involved in osteoblast recruitment, attachment and spreading. Additionally, periostin expression has previously been shown to be significantly increased by both transforming growth factor beta-1(TGFbeta1) and bone morphogenetic protein (BMP-2). OSF-2 has a typical signal sequence, followed by a cysteine-rich domain, a fourfold repeated domain and a C-terminal domain. The fourfold repeated domain of OSF-2 shows homology with the insect protein fasciclin Periostin mRNA is expressed in the developing mouse embryonic and fetal heart, and that it is localized to the endocardial cushions that ultimately divide the primitive heart tube into a four-chambered heart.